Integrated technology helps create a seamless workflow process. When two or more programs work well together within an environment it allows for greater functionality and productivity when working on your objectives. A good example of co-operative integration are Worldox and Microsoft Outlook. To provide a bit of background, Worldox is a document management system that allows users to store and retrieve documents in a systematic way. Sitting between a computer’s file system and application, the system provides complete security and visibility across the organization for all documents. Microsoft Outlook is one of the most popular email software systems used by a firm to send and retrieve email messages. Let’s say that a firm is currently using Microsoft Outlook for email and decides to add Worldox into their infrastructure. Adding Worldox will cause a number of applications to gain additional features inherent to Worldox. 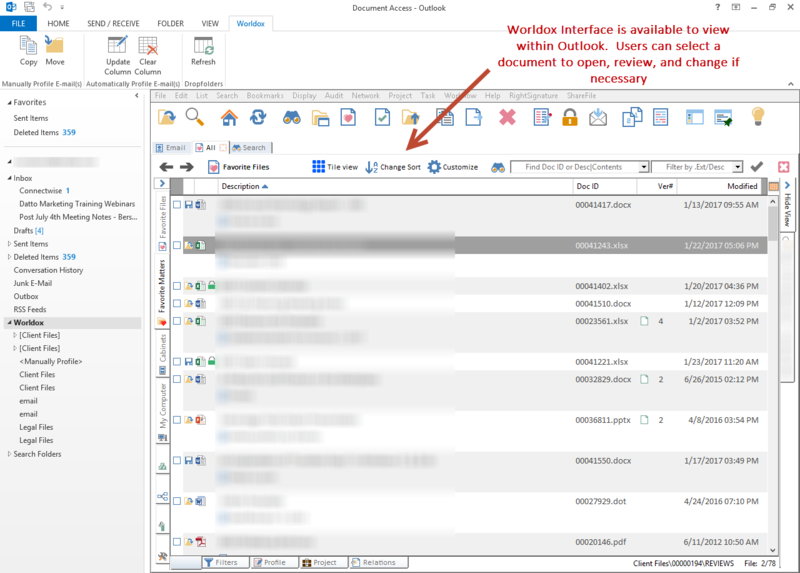 In the case of Outlook, a Worldox tab will appear on the task bar on the top of the screen which users can access. 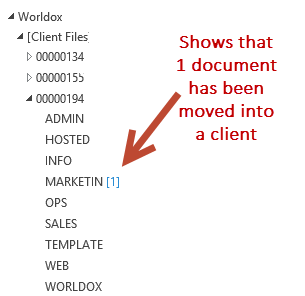 A Worldox folder will also appear on the folder tree in Outlook on the left hand side of the page. What can Worldox and Outlook do Together? The primary advantage of Worldox and Outlook working together is the ability for the users to save email directly into Worldox. Here are some examples of what the two programs can do. If a business is using Worldox to store their files, retrieving documents from Worldox and attaching them to email messages is a natural. 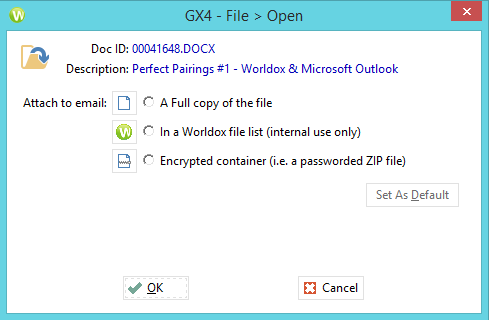 When users click the “Attach a File” icon in Outlook, the Worldox desktop window opens. Users are then able to choose the file that they want to attach to the email. But unlike Outlook on its own, Worldox brings full searching capability allowing the user for find the attachment no matter where it resides with as much or as little information that is known about the document. After choosing a format, the file will then attach itself to the email and is ready to send. Worldox saves valuable space in the email system for internally shared documents by allowing a small pointer file to be attached to the email message. Whether attaching one document or a whole folder, the pointer is the same size and takes very little space. When the other user clicks on the pointer in email, all the files represented by the system are presented. It is also possible to ZIP the files and compress them into a ZIP file during attachment. Copy – Allows you to copy email messages from Outlook directly into Worldox. Copying messages into Worldox will not take the original message out of Outlook. The user will have two copies of the same email, one in Outlook and one in Worldox. Move – Allows you to move emails messages from Outlook directly into Worldox. Unlike the “Copy” icon, when selecting Move, the email message will be removed from your Outlook folder and transferred into Worldox. 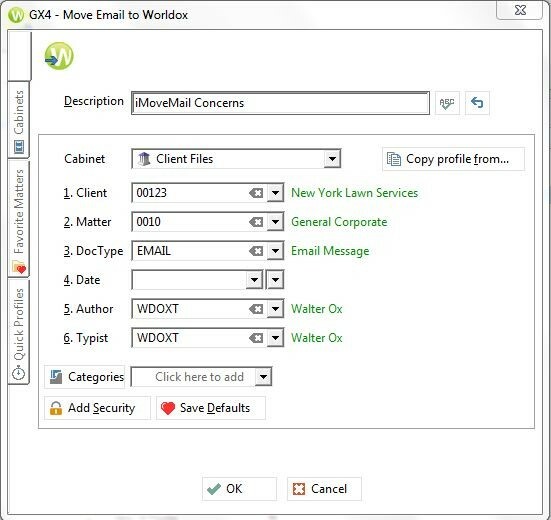 A profile card from Worldox will pop up, prompting the user to fill in the designated windows with the right client information, which will consistently save the email message into Worldox. Other users will then be able to find and retrieve the message not matter who saved it. And the email never changes – full fidelity is also kept in the email after saving to Worldox including the ability to reply or forward the email to others – the same as in Microsoft Outlook. 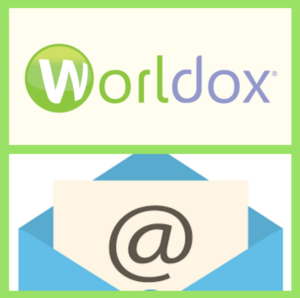 Update Column – As you use the system Worldox learns your habits and retains information about a specific email sender and where a user typically saves messages from that sender into Worldox. For example if John Smith’s emails are usually saved in company file “Jamestown Corp”, email heuristics will work to automatically profile those emails into that company file. It helps to save time for the user will not have to manually enter the information each time. Clear Column – Let’s say John Smith quits Jamestown Corp and moves to New World Industries and all associated emails must now be saved under this new company file. The “Clear Column” button in Outlook allows you to wipe the email heuristics designed for specific emails. Therefore, John Smith will no longer be automatically filed in Jamestown Corp and the user is free to file him elsewhere. Email messages can be dragged and dropped directly into Worldox through the folder tree. A user selects the designated email and drags it to the appropriate client folder in the folder tree. When this is done, the email automatically gets all the attributes associated with the folder location making it super easy to save emails consistently into Worldox. The Worldox folder tree also allows users to access the complete Worldox desktop within Outlook where they are able to open and review documents. Keeping track of emails is an important job. With the amount of emails business owners receive per day, keeping track of the important messages is a monumental task. Outlook and Worldox seek to eliminate some of this hassle by providing easy integration between the two programs and allowing users to easily save, categorize, and file their email messages. As we move towards a paperless workplace, the Outlook/Worldox integration is a key component to better automation and workflow processes. Interested in learning more about how Worldox can create a seamless document filing and retrieval system? Connect with us at 647-426-1004 for more information or a free demonstration!